Prosecution by public prosecutors includes indictment and request for summary trial procedure. Reasons for non-prosecution dispositions include  a lack of the conditions needed in prosecution (a complaint in the case of offenses indictable upon a complaint, etc. ),  cases that cannot be proved to constitute an offense (including the case of insanity),  suspicion of a person having committed an offense not being provable. In addition,  even if the suspicion of a person having committed an offense can be proved public prosecutors can suspend prosecution if their prosecution is deemed unnecessary in light of the character, age, or circumstances of the suspect, the seriousness and nature of the offense, or change in the circumstances after the offense was committed. Fig. 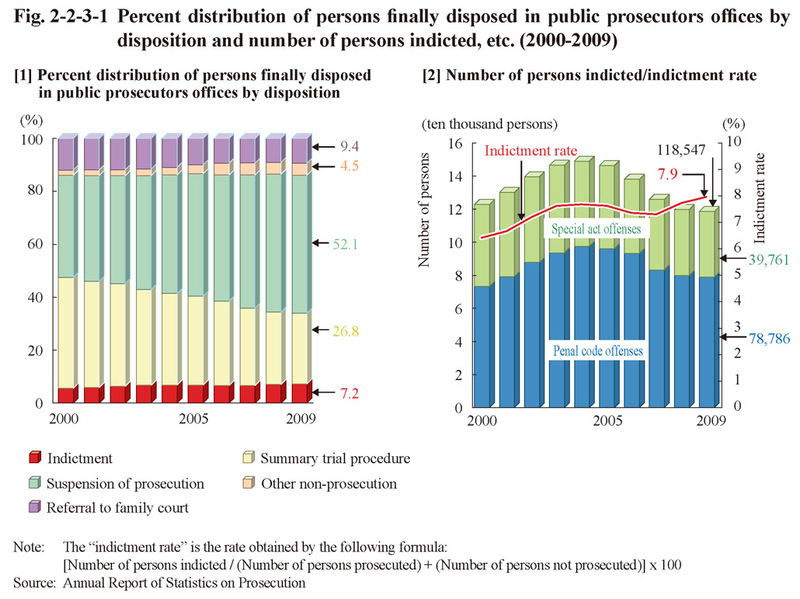 2-2-3-1 shows the percent distribution of persons finally disposed in public prosecutors offices by disposition, number of persons indicted, and indictment rate (including juvenile cases) over the last 10 years. Of 1,648,700 persons finally disposed in public prosecutors offices in 2009 (down 62,164 or 3.6% from the previous year) the number of those indicted was 118,547, that of those requested for summary trial procedure 441,047, that of those granted suspension of prosecution 859,768, that of those not prosecuted for other reasons 74,455, and that of those referred to family courts 154,883. The number of persons indicted was increasing every year from 1995 on but then started to decrease in 2005. In 2009 it had decreased by 1,248 persons (1.0%) from the previous year (See Appendix 2-2). Fig. 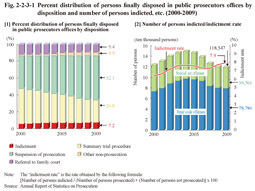 2-2-3-2 shows the number of persons finally disposed in public prosecutors offices that were then prosecuted, granted suspension of prosecution, or not prosecuted for other reasons and the prosecution rate by type of offense over the last 10 years (See Appendix 2-3). Negligence in vehicle driving causing death or injury, etc. 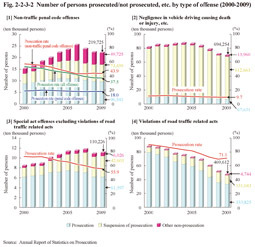 and violations of traffic related acts accounted for the majority of the number of persons disposed, although the number of persons disposed and prosecuted for violations of traffic related acts has significantly decreased over the last 10 years. 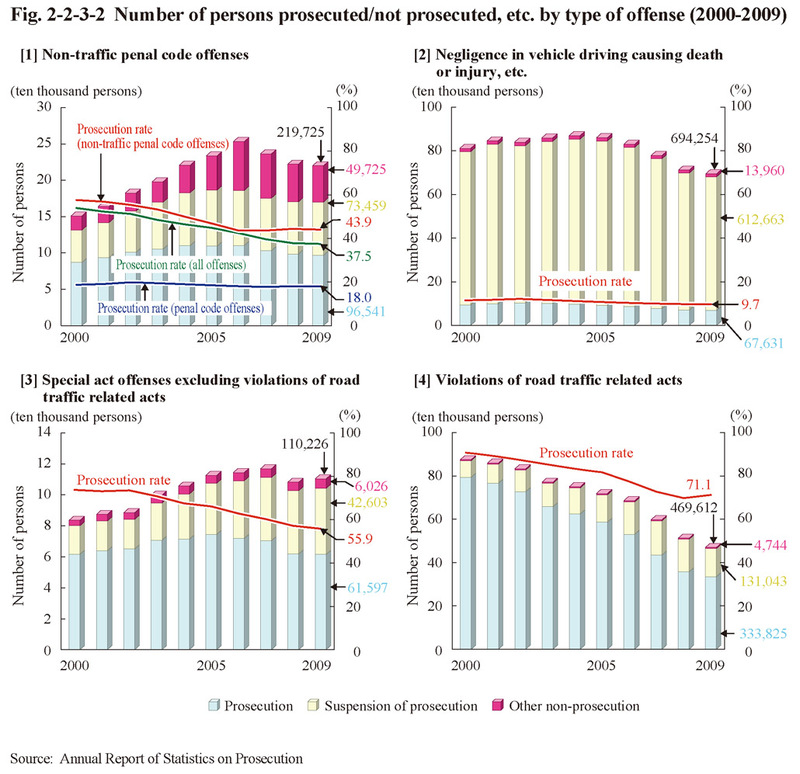 Table 2-2-3-3 shows the number of persons not prosecuted in 2009 by reason (limited to cases for non-traffic penal code offenses and special act offenses but excluding violations of road traffic related acts).